Obama: Japan's Administration Of Disputed Islands Shouldn't Change : The Two-Way A standoff over sovereignty of an island chain that Japan calls Senkaku and China calls Diaoyu has been a source of deep tension between the two countries in recent years. President Obama speaks at a joint news conference with Japan's Prime Minister Shinzo Abe in Tokyo on Thursday. 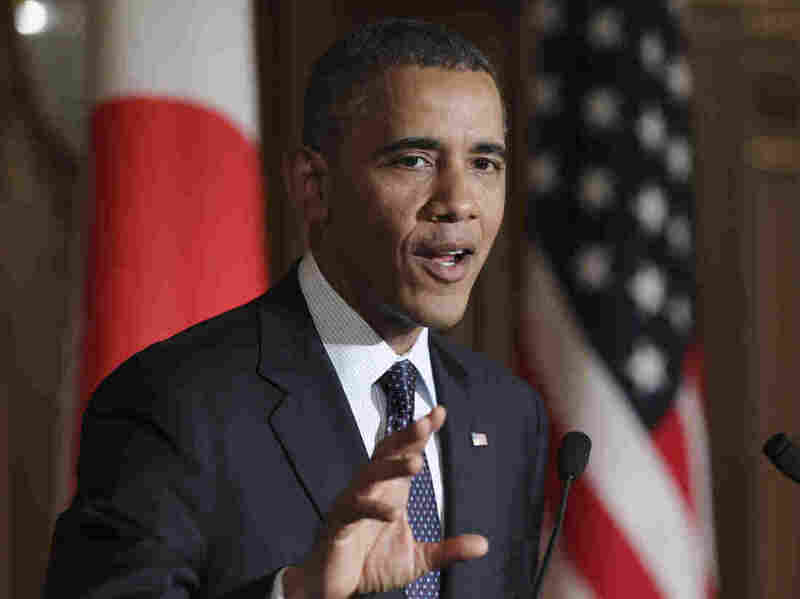 Obama reinforced the U.S.-Japan security commitment. President Obama said Thursday that the U.S. believes Japan's administration of a contested island chain should not change "unilaterally," as he assured Tokyo that a U.S. security treaty "covers all territories administered by Japan." Obama, on the first stop in a weeklong swing through the Asia-Pacific region, spoke alongside Japanese Prime Minister Shinzo Abe. As The New York Times notes, the president issued a "carefully calibrated statement" that "stopped short of siding with Japan in the dispute over who has sovereignty over the islands," which Tokyo calls Senkaku and Beijing calls Diaoyu. "Historically, [the islands] have been administered by Japan, and we do not believe that they should be subject to change unilaterally," Obama said, according to The Times. "What is a consistent part of the alliance is that the treaty covers all territories administered by Japan." "[The] U.S.-Japan alliance is the foundation for not only our security in the Asia-Pacific region, but also for the region as a whole," the president said after a meeting between the two leaders. "And we have continued to strengthen it. We are looking at a whole range of issues that are challenging at this time, including the threats posed by North Korea and the nuclearization that's been taking place in that country," Obama said. Abe, who spoke first, said the U.S.-Japan alliance "is indispensable and irreplaceable as the foundation for a peaceful and prosperous Asia-Pacific region." He said: "[Together] with the United States, Japan would like to realize our leading role of the alliance in ensuring a peaceful and prosperous Asia-Pacific." "... was partly vitiated by the failure to conclude a trade deal with Japan. Despite frantic, round-the-clock talks, negotiators failed to close the gaps on issues like access to Japan's beef and pork markets — further bogging down the Trans-Pacific Partnership, a regional trade pact that is a central pillar of Mr. Obama's Asian strategy. "With little to announce on the trade front, Mr. Obama and Mr. Abe kept the focus on managing rising tensions in the East China Sea, where China last year imposed an air defense identification zone as a way of asserting its sovereignty over those waters."